Helps maintain traction performance, improves worn appearance for a more premium look and optimizes all-terrain performance with an emphasis on winter traction. Opposing groove angles and increased contact surface area provide better mechanical locking of snow into the grooves which generates higher snow-on-snow traction forces. Provide stability for confident handling and reduces irregular wear for longer tread life and a quieter ride. Provide enhanced all-terrain performance while the more aggressive offsets improve snow and loose surface traction. Resists abrasions and provides reliable soft surface and snow traction. Retains and enhances all-terrain performance while increasing wet grip and winter traction capabilities without sacrificing treadwear. The distribution of sipes is designed to maintain even treadwear and a balanced distribution of torque across the surface of each tread element for consistent handling and grip. Promotes excellent stability, confident handling and responsiveness, especially in adverse weather such as slush, snow or ice. 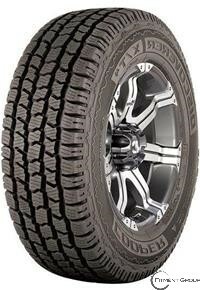 The center-rib tread elements provide great grip while standing up to harsh on- and off-road driving conditions. The four-season, all-terrain design is engineered to provide excellent on-road and off-road driving confidence in all weather conditions. The X/T4 tread pattern combines a number of features spefically engineered for solid all-terrain and winter performance as well as great stability, confident handling and reliable treadwear.